No trip to Valley Forge would be complete without a visit to the Freedom Foundation, a historic campus nestled deep within the manicured grounds of Valley Forge. This 52-acre historic campus contains the wooded trails of Medal of Honor Grove, the land in which one acre is dedicated to each of the 50 states of America, as well as Puerto Rico and the District of Columbia. These dedications are in honor of the various recipients of the nation’s highest honor and award of valor, the Medal of Honor. 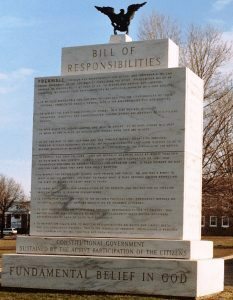 Each state has an obelisk patterned after the Washington monument, in which all recipients (3,400) of the medal are listed. There are only 26 states honored within this campus to date, each featuring their own state’s native stone for the material of the actual obelisk. After exploring the park in general your group should choose between the popular onsite trail, the American Walk of Honor (dedicated in April, 1977), or the Henry Knox Building. Within the museum your group will see the detailed explanation of each act of heroism, as well as the story of the evolution of the Medal of Honor. Learn all about the first establishment of the medal by U.S. Congress in 1861, as well as the story of the first stones design by the famous American artist Peter Max. While here your group may also explore the different working chapters and volunteers, as well as see if their home state has any Medal of Honor recipients.